by Unrepresented Nations and Peoples Organizations, UNPO. June 1, 2004. Iraqi officials introduced a new interim government Tuesday (1 June, 2004) nearly four weeks before sovereignty is scheduled to be transferred to the country. The U.S.-appointed Iraqi Governing Council dissolved itself Tuesday to make way for this new body. The caretaker government will be in charge after the June 30 political handover until national elections are held in January. The new government includes three women. 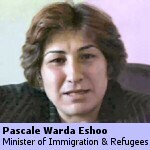 Minister of Displacement and Migration, Pascale Warda: Warda is president of the Assyrian Women’s Union in Iraq, applying her experience with human rights, refugees, and civil society in her work with Assyrian women. Ms. Warda co-founded the Iraqi Society for Human Rights in Damascus, Syria, and served as the representative of the Assyrian Democratic Movement Foundation (ADM) in Paris—the highest position of any woman in the ADM, which is the primary Assyrian political party in Iraq. Ms. Warda holds a degree from the Human Rights Institute at the University of Lyon in France. Minister of Human Rights, Bakhityar Amin: Born in Kirkuk, educated in France and Sweden. Executive Director of the International Alliance for Justice. Mr. Amin has worked extensively with several organizations (incl. UNPO) on minorities, indigenous peoples, women's rights, land mines, ICC, freedom of expression, liberating prisoners and conflict resolution. Vice President, Rowsch Shaways. President of Kurdistan National Assembly; and member of Kurdistan Democratic Party, one of two rival parties running the Kurdish north of Iraq. Foreign Affairs Minister, Hoshyar Zebari: Since his appointment in July as foreign minister of Iraq's interim government, the 51-year-old Zebari has traveled worldwide to canvass support for what he calls a new, united and democratic Iraq. Iraq's first Kurdish foreign minister was a guerrilla fighter during Kurdish rebellions against ousted Iraqi leader Saddam. Deputy Prime Minister for National Security Affairs, Barham Salih: Close to the Americans, a leader in one of the main Iraqi Kurdish groups, the Patriotic Union of Kurdistan; served for 10 years as the Kurdistan Regional government representative to the United States; born in 1960. Already a crisis for the new Iraqi government loomed Tuesday as Kurdish leaders threatened to withdraw from the Iraqi state unless they received guarantees against Shiite plans to limit Kurdish self-rule. Letter from Barzani and Talabani was sent to President Bush. Minister of Science and Technology, Rashad Mandan Omar: Omar was already Minister of Technology, in the cabinet appointed by the Interim Iraq Governing Council in September 2003. A Sunni Muslim and Turkoman, originally from Kirkuk, Omar is an engineer by training and recently returned to Iraq from a period working in Dubai in the field of airport construction.